Google Docs is an effective way of creating and sharing documents online with complete security and encryption. Companies working around the globe are often required to share docs with their offshore employees or business associates. They need translation help to convert the documents into languages which the receiver can understand. Translation tools and machines help the companies in document translation like PDF translation, doc translation or web based translation. Once you are logged in, you can click on the upload button. Now browse and select the PDF file you want to upload. You will notice an uploading progress bar. Once the bar is completed to 100%, you are done uploading your PDF file to Google Docs. You can now preview or share you document at any time by simply logging to your docs account. Google docs are also a great way to store your Gmail attachments and files. The only limitation is that the user will be unable to edit PDF file in Google Docs. However, previewing, saving and sharing of PDF files can be done easily and efficiently. The online app has an amazing support for creating and editing numerous popular formats like the text documents, spreadsheets and presentations. The software is designed for teams and helps you work on a single document collectively. The editor of the Docs is completely HTML enabled and can work with rich documents with images, tables, frames and drawings. You can either make your document public or private or can simply share it using a link. You can also integrate the document on your website or blog. Modern translational technologies and Google Docs have made it possible for people to translate and share their documents easily and effectively in any local language. Translation tools play an important part while communicating to people outside your territory or community. If you are in a situation where you are required to communicate with people of different territory, you can always take translation help or utilise a translation tool. 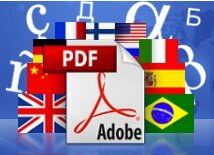 Automatic translations for PDFsMultilizer PDF Translator translates PDF documents automatically. Whether you need to understand user guides, manuals, memos, slide shows or other PDF documents quickly, Multilizer is your solution. Download Free version here.